Make your wedding day a true fairytale romance with a traditional white horse, or a horse-drawn carriage. Every young princess dreams of the day when her Prince Charming will swoop by on his white horse and whisk her away into the sunset, for a life lived happily ever after. We can't guarantee all of that, but here at Kudos Music we can certainly provide you with the perfect white horse to begin your fairytale wedding with. The white horse has been deep-rooted in Indian and Pakistani wedding traditions for centuries now. The white horse in some cultures signifies fertility which could be the main reason for it being such a significant part of many South-Asian weddings, but aside from that the tradition is exciting, different and beautiful and one which is upheld even today. 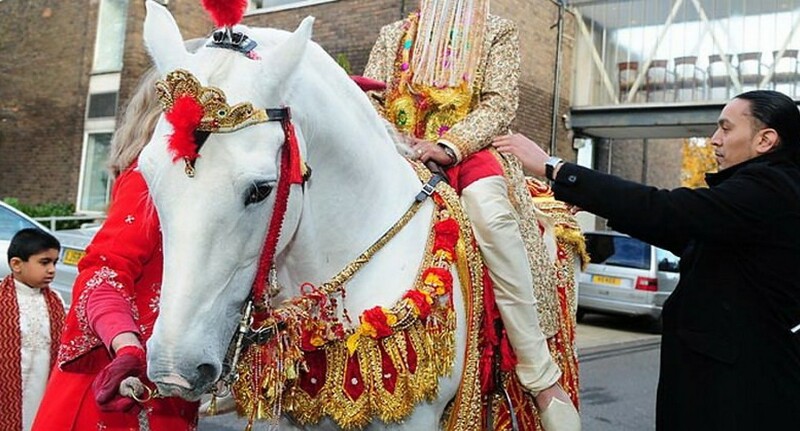 As part of your 'Baraat' (the name for the bridegrooms wedding procession in India and Pakistan), why not bring a little bit of Indian/Pakistani culture to the streets of Britain by booking your white horse through Kudos Music today? With you riding along on the white horse in front of your Baraat and leading the way, the effect will be tremendous, turning heads everywhere you go. After all, it's not the norm to see horses on the streets in the UK unless being ridden by police officers, right? We can dress up your white horse however you wish. In true traditional style, we can dress the horse up with Indian eccentricities with a lot of gold, flowers and brightness, decked out from head to foot. Or we can keep it simple; whatever you choose we'll ensure the horse looks its best for you. Our horses can also come with their own carriages, a stunning way for a bride to arrive on her wedding day or for the couple to leave in after it's all over. Our carriages can also be decorated according to your preferences. Our horses are fully trained to be comfortable around noise and excitement, which you get in abundance at any South Asian wedding, ensuring you are as safe as possible at all times. Even surrounded by the sounds of the dhol, people dancing this way and that way and singing at the top of their voices, our horses will calmly make their way through without so much as a flinch. If you've found your princess and earned your status of Prince Charming, then finish it off with a beautiful white horse to make your grand entrance on, on your wedding day. Call us today! Why not book a Kudos Desi Indian Wedding Horses for your wedding or event today! Contact the sales team to see how we can find the perfect entertainment for you.